Type your city/state and see where your office ranks for the terms your clients are using to find the services you offer. Very cool! Local Search Marketing is about attracting Local Clients and Customers … people who want to work with a financial advisor in their community. 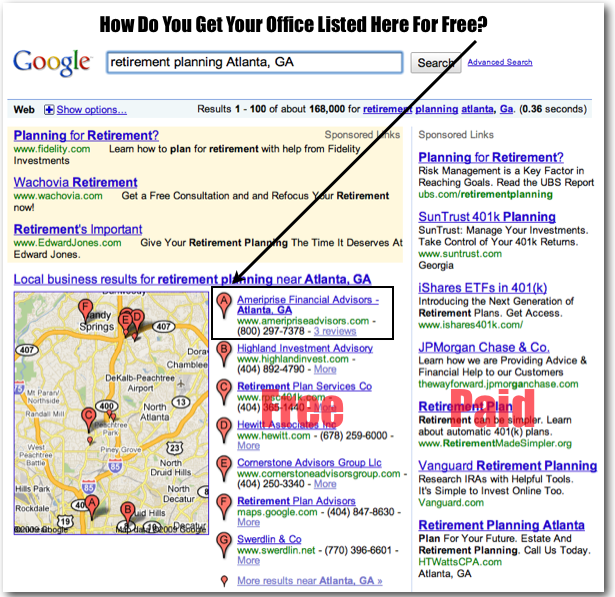 By being listed at the top of the free Local Search Results page, you won’t be seen as a salesperson, but rather as the most qualified financial advisor in your community. Where Does Your Office Rank? Check where your office ranks on Google, Yahoo!, Bing, Merchant Circle, Yelp, SuperPages and Local.com for the following financial terms. (CPC) Cost Per Click shows you how much your competitors are paying (per click) to be listed in the sponsored section. They would not be advertising here if this was not a good investment. If your office is not showing up for the most commonly used terms people are using to search for the services you offer, you can do one of three things.